The RoadKill challenge will be played utilizing the RV above every week until this twist is laid to rest. This week we suspect Frank won the challenge and Nominated Paul. This is how it works. After the HOH, Before the POV the roadkill competition will be played. The winner of that can secretly nominate one house guest. Since the competitions outcome has to be a secret these contests will most likely be timed challenges. If the nomination the roadkill winner had selected is saved from being on the block via a Power of Veto the Roadkill winner selects the re-nomination. The very first Big Brother Road Kill will have the houseguests stripping down out of a track suit (complete with tube socks) into their bathing suit while trying to keep the three buttons in front of them pushed down at all times. The houseguests will start with their right foot and both hands on the buttons but are able to use any body part to keep the buttons down once the timer starts. If one button is released, the timer will speed up by 30x until the button is pressed down again. If two buttons are released at the same time, the timer will speed up by 60x. If all three buttons are released at once, the timer will speed up by 120x. Ultimately, the houseguest who completes the task with the shortest time on the timer will be declared the winner. They will be informed of their win secretly in the diary room. What exactly the power the winner will receive has yet to be revealed, but in the past contestants have won abilities to take a nominated houseguest off the chopping block, decide who is on slop for the week, win money or divvy out various other punishments or rewards. 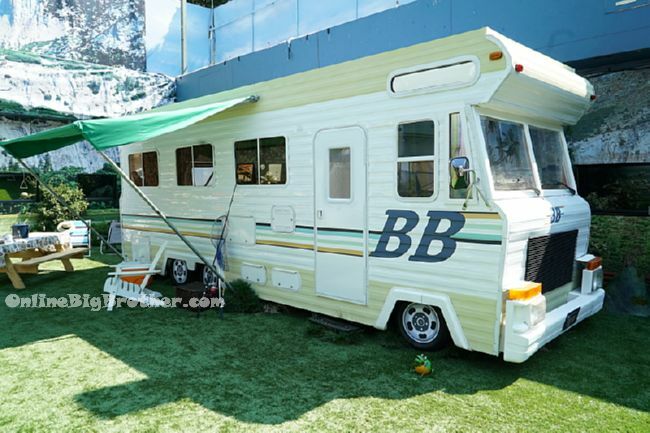 Each week, the competition will take place in the Big Brother RV, which will be moved into the backyard specifically for the competition. This looks like a fun, new change-up…the potential to wreck a carefully choreographed HOH is exciting! I look forward to watching the shows because life gets busy and I miss some of these posts, although I try my best to get onto this site often. My prediction is that Tiffany and James go far this year!